Colnaghi – Bernheimer, the oldest Old Master Gallery in Europe, follows the Venetian theme at this year’s Grosvenor House Art & Antiques Fair, by adding two masterpieces by artists based in Venice to their collection of works from the major schools of European painting, spanning the sixteenth to the nineteenth centuries – Il Padovanino from the seventeenth-century and Antonietta Brandeis from the nineteenth-century. Venus blindfolding Cupid by Alessandro Varotari called Il Padovanino, (Padua 1588 – 1648 Venice) is a copy of the famous The Three Graces or Cupid’s Education by Titian (now in Galleria Borghese, Rome). Exceptional in its strength and modelling, the Colnaghi painting is a particularly fine example of the work of an artist who, far from being a mere copyist, painted pictures which evoke the spirit, not just the forms of the great Venetian sixteenth-century master whom he admired so much; and provide an important bridge between the Golden Age of Venetian painting and the revival of classicism in Rome in the seventeenth century. Il Padovanino was well regarded in Venice and a member of the Venetian Guild of painters, the Fraglia, from 1615 to 1639, enjoying many public commissions, of which the first major work was the Wedding at Cana in the Scuola Grande di San Marco in Venice, which is signed and dated 1622. The Colnaghi-Bernheimer painting is a mature work of Padovanino and may be placed during his second visit to Rome in 1625. Our sculptural figures herald those of Venus and Adonis in the Collection of the Prince of Liechtenstein, Vaduz, which Ruggeri dated to be from 1630. Venus blindfolding Cupid is typical of Padovanino’s interest in penetrating the secret of Titian’s pictorial technique and it is this, rather than the subject matter, which is Il Padovanino’s primary interest. Both the individual figures and the overall composition are directly borrowed from Titian, but Padovanino does not content himself with imitating Titian’s forms as an academic exercise, but is also interested in evoking his pictorial effects. The rendering of the faces of Venus and Cupid and Venus is by no means a slavish copy of the Titian prototype, as Il Padovanino invests them with his own individual combination of realism and grace, the figure of Cupid leaning over the shoulder of his mother Venus, being reminiscent the Allegoria in the Pinacoteca del Castello Sforzesco, Milano. The elaborate architectural background, a common trait in her oeuvre, depicts the daily life of various Venetians: fishermen and fruit merchants, working or resting in the cortile, overlooked by the domes of the Salute. Brandeis uses the pictorial technique of impasto to restore the beauty of the architecture of Venice which is contrasted with the smoothly and eloquently painted figures. The depiction of their different tasks contrasts with the nobility of their postures, which remind one of Ancient statues, particularly the woman pouring some water, the lying child, and the dreaming young Venetian. 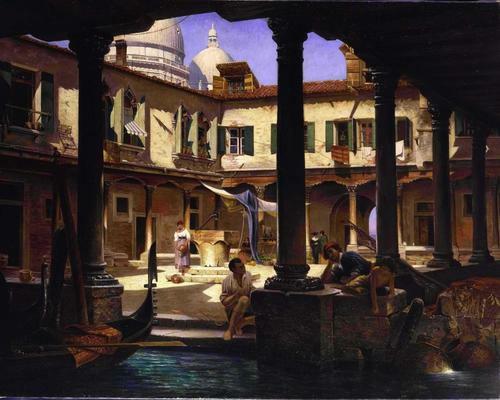 The majority of Brandeis’ work is devoted to views of Venice and this extraordinary city provided a wealth of inspiration to the imagination of artists throughout the centuries in Europe and Brandeis’ depictions are amongst the most luminous and vibrant of their kind. Antonietta Brandeis moved to Italy early in her career settling in Venice for most of her life where she concentrated on painting architecture. She also travelled to both Rome and Florence painting extensively in both cities. However, it was Venice where she had made her reputation. Brandeis specialised in small intimate scenes of her adopted city and exhibited throughout Europe. Heiress to the great tradition of vedute artists, like Panini, Brandeis soon developed a style of her own and enjoyed a great reputation among the most important artists of the period. Colnaghi’s new season’s catalogue, illustrating recent acquisitions will be available on the stand at the Grosvenor House Art & Antiques Fair and from the London Gallery. The successful ‘Nature Morte’ exhibition of recent photographic works by contemporary photographer Guido Mocafico; a collaboration between Bernheimer Fine Art Photography and Hamiltons Gallery, will continue up to and including Wednesday 18th June at Colnaghi’s galleries in Old Bond Street. P. & D. COLNAGHI & CO., LTD.
Colnaghi was established by Paul Colnaghi and his partner Anthony Torre in Paris in 1760. The original shop in Paris, known as the ‘Cabinet de Physique Experimental’, dealt in scientific instruments imported from England and they quickly branched out into print selling, importing English mezzotints and barometers. After managing a new shop in the Palais Royale, Paul Colnaghi took over the London branch of the business, based in Pall Mall in 1783, and as a result of the French Revolution transferred the business to London becoming print sellers to the Prince Regent (later George IV). Colnaghi established itself initially as the premier dealership for prints. By the end of the 19th century the firm had begun dealing in Old Master paintings and drawings and was instrumental in the formation of some of the most important American collections, including that of Isabella Stewart Gardener, Henry Clay Frick and Andrew Mellon. In 2002, the Old Master paintings dealer Konrad O. Bernheimer, the fourth generation of one of Europe’s major art dealing families, acquired Colnaghi. Under the Colnaghi umbrella, Bernheimer joined forces with the renowned Old Master drawings dealer Katrin Bellinger. In October 2006, Hauser & Wirth opened their third London gallery at the Colnaghi building in Bond Street – Hauser & Wirth at Colnaghi. Bernheimer and Bellinger continue to maintain a presence in Munich, Bernheimer Fine Old Masters, and Katrin Bellinger Kunsthandel. Colnaghi continues to operate as one of the world’s most important dealerships, specializing in Master paintings and drawings from the fifteenth to the nineteenth century. Founded by Lehmann Bernheimer in 1864, Bernheimer Fine Old Masters dealt initially in textiles and oriental carpets, before expanding to include Italian Renaissance furniture, French antiques, tapestries, porcelain and objets d’art. By 1900 Bernheimer had become purveyors to the Court of Bavaria and its clientele included members of the European aristocracy and American magnates, such as William Randolph Hearst. Konrad O. Bernheimer, great grandson of Lehmann, is the current owner and chairman of Bernheimer Fine Old Masters. Under his direction, the gallery now specializes in Old Master paintings. Recently one of his daughters, Blanca has set up Bernheimer Fine Art Photography and holds regular exhibitions of contemporary photography.